Civil and structural engineers build big all around the world. Two of the most exciting sectors are civil and structural engineering. You get to build big, and get to do all over the world. You tap creativity, collaboration, and perpetual learning. And the fruits of your labor are the infrastructure that billions use every day. 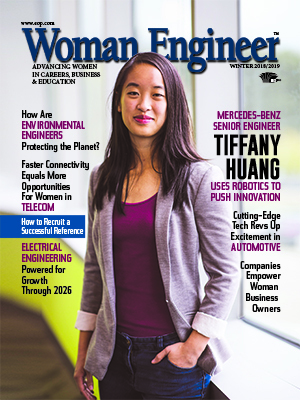 Here are five woman engineers thriving in these sectors, which are increasingly seeing an uptick in demand for engineers to meet growing domestic and global infrastructure demands. Ehiaghe Akojie, a project manager for Messer Construction Company, oversees commercial projects, from project planning all the way through owner occupancy. She ensures the job is completed safely, on time and on budget. However, there are myriad challenges between conception and a building ready for occupancy. Akojie also dispenses advice and encouragement. Messer’s portfolio includes complex, commercial construction projects in the aviation, healthcare, higher education, industrial, and science and technology market segments. The company is located in 10 regions throughout the Midwest and Southeast. “We pride ourselves on being a local builder with national resources and expertise, and have been in business since 1932,” she points out. Akojie prides herself on performing under pressure, as well. “The construction industry is a fast-paced industry, and it sometimes can be a challenge to keep up with the demands and schedule of a client as it changes through the course of the project,” she says. At the end of each day, Akojie revels in the collaboration that produces tangible outcomes. “The fast-paced and challenging experience is what drew me into the construction industry,” she shares. Messer is headquartered in Cincinnati, OH. Job openings are posted at messer.com/join-us. Learn more through Facebook, Twitter and LinkedIn. Weiwei Yu, a facilities engineer at Chevron Energy Technology Company, designs, fabricates, and installs pipeline systems to transfer oil and gas from deep-water reservoirs to floating production units. She’s proud of the work that she and Chevron do. Yu always enjoys her colleagues and the state-of-the-art science. “I’m honored to work with highly talented people who apply cutting-edge technologies to help achieve these goals in their daily work. It’s my privilege to be a member of the team,” she shares. Yu is also proud of Chevron’s care for communities near and far. “In the most recent Thailand Tham Luang cave rescue, Chevron Thailand activated its Emergency Management Command post to provide round-the-clock operational support to the rescue mission,” Yu explains. Chevron also undertook another wet challenge closer to home. “Following Hurricane Harvey, Chevron, its employees and retirees donated more than $6 million to Harvey relief and recovery efforts,” she points out. What’s more, Chevron offers flexible schedules. “After my second maternity leave, I was working on a major capital project in the fabrication stage. It was an intense project with a rapid learning curve,” recalls Yu. Chevron can help balance a life, but sometimes a young engineer must regain her own internal balance. “I was not very confident when I first joined Chevron: there were so many things that I did not know. This sometimes made me reluctant to share my thoughts during meetings, and I worried that people would think I was not smart enough,” Yu reveals. If you’re graduating and want to move into Chevron’s 51,000-strong, worldwide workforce, then take the time to learn more about Chevron. “I highly recommend students spend time to know Chevron as a company and tailor your resume,” Yu further advises. Headquartered in San Ramon, CA, Chevron’s job openings are at careers.chevron.com, and learn more about Chevron through Facebook, Twitter, LinkedIn, Instagram and YouTube. Theresa Maahs-Henderson, a project manager for Stantec, designs projects for transportation infrastructure, and provides services to clients that include environmental documentation, technical studies, roadway design, construction document development and permitting. She’s one of 175 employees in St. Paul, MN and of approximately 22,000 employees working in more than 400 locations across six continents. Stantec is global, but feels otherwise, according to the project manager. “I love that each office has a community-minded focus. I’m working on local projects that require intimate knowledge of the area and the community that the projects will eventually serve,” she shares. Maahs-Henderson has reached a point in her career where she can advocate for young engineers, as was once done for her. “My career did not really start to accelerate until I had someone within Stantec with enough power and stature to recommend me for roles that were a step-up from where I was at the time,” she points out. And if you’re not given a requested opportunity? “Even in that situation, you have made it clear where you would like to be and where you think you deserve to be,” she answers. In addition, to be chosen for opportunities, determine where you’re weak and work on that, Maahs-Henderson further advises. “I started out as a fairly stereotypical engineer. I enjoyed the technical aspects of my work and found public speaking quite terrifying. I thought that the people who looked so comfortable presenting were just naturally charismatic,” she says. Maahs-Henderson soon realized she would have to acquire the “charisma” she saw in others. You can also acquire confidence through Stantec’s employee resource groups (ERG). Headquartered in Edmonton, Alberta, Canada with more than 400 locations globally including the U.S., Stantec’s job openings are at stantec.com/en/careers, and you can learn more via Facebook, Twitter, LinkedIn, Instagram and YouTube. Yeshim Jones, a project manager for Turner Construction Company, manages construction projects throughout the preconstruction, construction and close-out phases. As such, she does the work before the work that the rest of us see. “People usually equate construction to inconveniences like road shut-downs, noise, smell, reroutes and more, but construction involves other things like sales, estimating, budgeting, engineering, preplanning, problem-solving and so on. Before we actually get to mobilize on site, a lot of work has already been done,” she explains. All of that preconstruction makes actual construction deeply pleasing to Jones. “When I walk a job site and see workers building structures, that gives me a sense of satisfaction because that’s the end result of many hours preparatory work!” Jones enthuses. The preconstruction and construction require Jones to interface with many professions, which Jones loves. “There’s also a lot of interaction with my project team, subcontractors, architects, engineers, end-users and community. I get to know and build relationships with many wonderful people and learn new things every day,” she notes. Jones has her own family, and Turner has had her family’s back. “What I love about Turner and my job is the flexibility it has given me. Throughout different phases of my life, my priorities changed. When I first started, I was in the field at job sites, which was fun,” she elaborates. Then others tugged at her sleeve…literally. “When I had my kids, being in the field was not the right fit for me due to demanding and unpredictable hours. When my kids were young, I was able to move to the preconstruction department, which gave me a more predictable schedule,” she states. Jones supervises six colleagues, and she’s achieved by connecting. “I highly recommend being involved in an industry organization that you’re passionate about. This means more than just attending to the events. It means becoming involved in it,” she believes. Jones has sought connections, and Turner wants to facilitate the same thing. An eye for history further helps keep Jones on her game. “Most of us are amazed with the historic structures and buildings. We ask ourselves how they built these structures,” Jones observes. Turner is headquartered in New York, NY. Explore open positions at turnerconstruction.com/careers, and learn more through Facebook, LinkedIn and Twitter. Chloe Pascoe is one of 77,000 Jacobs employees in more than 40 countries. It’s a deeply diverse workforce by design. “Diversity of skills, knowledge and perspective are important to Jacobs. We’re much more likely to find a better way to address a client’s challenge with a diverse team of people with different backgrounds and perspectives. It encourages creativity, collaboration and innovation,” she underscores. Specifically, Pascoe is a project controls apprentice, one of many professions at Jacobs. “Alongside employees with a wide range of engineering backgrounds, Jacobs also recruits professionals as diverse as animators, data analysts, ecologists and economists,” she elaborates. And what does Jacobs seek in its hires? “Jacobs looks for self-motivated individuals with a passion to advance and grow their capability in an environment that nurtures professional development,” Pascoe answers. Some of those projects are as diverse as Jacobs’ workforce. “We’re playing a lead role in programs around the world including being NASA’s largest non-original equipment manufacturer services provider, working on everything from design and build to launch and maintenance, including on-going support for the Space Launch System and Orion deep-space exploration program,” she notes. Partnering with NASA is part of Jacobs’ grand plan. “Jacobs is much more than a traditional engineering and construction provider,” explains Pascoe. Just as Jacobs does, Pascoe pushes beyond traditional boundaries and exceeds expectations. She’s also been able to soar past her own goal and expectations. “Exceeding my potential helps me in becoming a good role model for others. Throughout my apprenticeship, I’ve consistently surpassed expectations by mentoring students and apprentices,” Pascoe shares. Pascoe has experienced the power and potential of apprenticeships, too. Plus, she keeps pushing herself to support others. “I’m chair of Jacobs Future Network - a cohesive network of graduates, apprentices and early career professionals that aims to promote continuous career development,” she points out. Headquartered in Dallas, Texas, Jacobs posts job openings at jacobs.com/careers, and you can learn more through Twitter, LinkedIn and Facebook.